Building a "Fellowship" on the Web. Last week I posted this article, with a TED talk presented by Steve Whitla, based in the UK. Today Steve sent me a Tweet, pointing me to a thoughtful article he'd written, in response to my article. He focused on the three challenges I'd offered in my article, and expanded on them from his own perspective. I hope you'll take time to read it. 1) Challenges of Making Maps - Steve recognizes a truth that I've understood for many years. In the past I've had people question the value of the maps I've created, saying people in poor areas don't have access to the technology to view the maps. I said, "I know. I'm trying to reach the people who don't live in poor areas who have the resources to make technology and access to my maps available to people in poor neighborhoods, and who will help me collect the data, build the maps, and train people to use them." In Steve's article these would be the "Gentry" who supported map-making in the middle ages. 2) The Challenge of Motivating Growing Numbers of People to look at the maps. I love the reference to Bilbo, from The Hobbit and Lord of the Rings. I've read the series several times. My graphic above draws from another fantasy series, the Wheel of Time books by Robert Jordan. In both books a small group of people band together to save the world. In both books the 'hero' was a reluctant 'hero'. I never sought the role I'm in. It grew on me over many years. In Steve's article, he focuses on the 5% of people in an organization who might already be interested in an idea. My efforts have focused on the same 5%, or even 1%, of people in the world who might be interested in the work I'm doing. 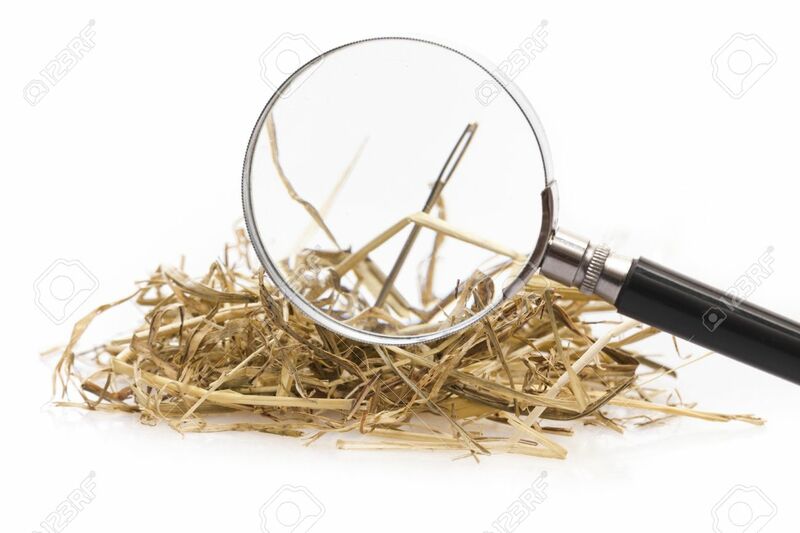 That's like looking for a needle in the universe! Yet, that's how I connected with Steve. I created this concept map to show the different skills and networks I'm trying to bring into my fellowship. 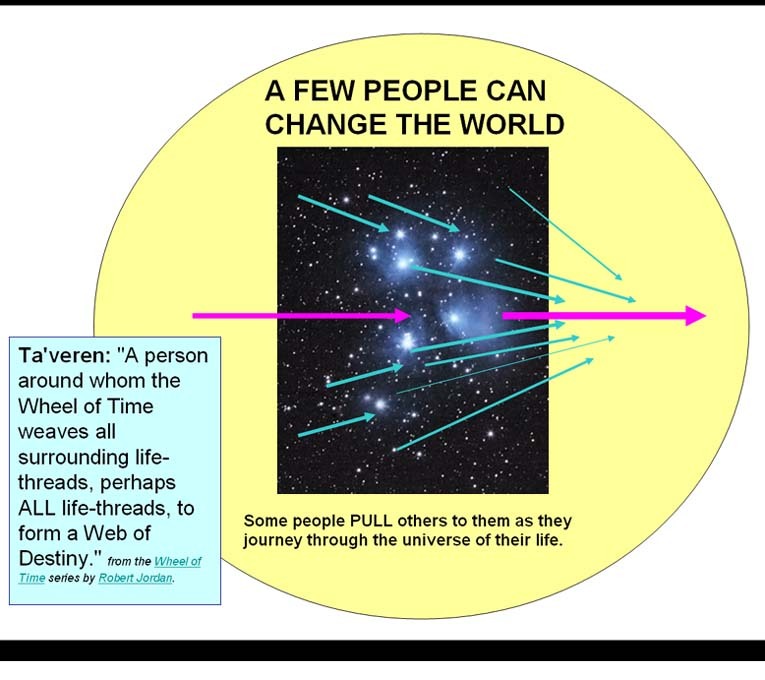 I first used the Wheel of Time graphic in 2011, in this article. 3) The Role of Network Builder, Facilitator and Teacher. In Steve's article he writes "If we're all looking a the same map, then we have a much more meaningful conversation." That's what I think, too, but it takes us back to Challenge 1 and Challenge 2. 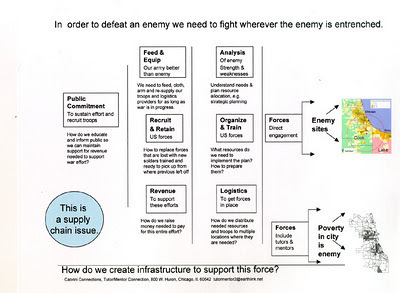 I've used this pyramid graphic often since the mid 1990s, such as in this article. I've created a library of concept maps, that support the GIS maps. Steve's blog is full of visualizations. If more people spend time trying to understand these, when we get together we are closer to a common frame of reference. In my case, I feel that we all want kids to go safely through school and enter jobs and careers as contributing members of society. However, if someone is not doing the work at the bottom of the pyramid, of creating a map-based information system, it's hard to have a 'meaningful conversation' about actions each of us needs to take to make that support system available in all places where kids need extra help. If people are not motivated to spend time looking at these articles, and our maps, our meetings lack the common understanding and frame of reference needed. Back to Challenge 2. Final Challenge - Remaining Neutral - Steve added this since I did not mention it in my original article. I think that if the data on the maps is accurate, anyone can use the map to develop strategies that support a common vision. 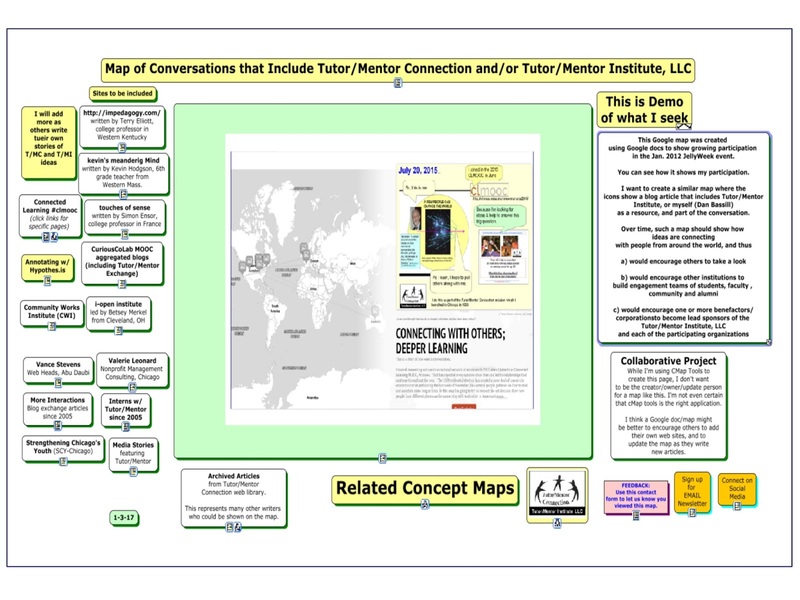 In articles on this blog I point to many data platforms, not just the interactive Tutor/Mentor Program Locator and maps the Tutor/Mentor Connection has created. Keeping the maps updated and accurate goes back to Challenge 1, which is finding the talent and resources to do this. Another Challenge - Overcoming "Not Invented Here". Over the 24 years that I've been doing this work, too many have started their own "fellowships", drawing support from political, business and civic leaders. Too few, like almost none, have reached out to say "What can I learn from your experiences? Or, "How can I help you?" Here's one of several articles that focus on this challenge. One more. It seems to me that Steve is writing about challenges within organizations, where there are many different power bases and hidden agendas. I'm writing about the challenge of mobilizing people from many different organizations and sectors of society - the village of people who need to take roles in raising kids and helping them move to productive adult lives. They also have power bases and hidden agendas. They don't have the structure, and pay check, provided by corporations, which offer some motivation for people to work together. That makes this even more difficult. I can't express how pleased I was that Steve took time to read my original article and reflect on it on his blog. 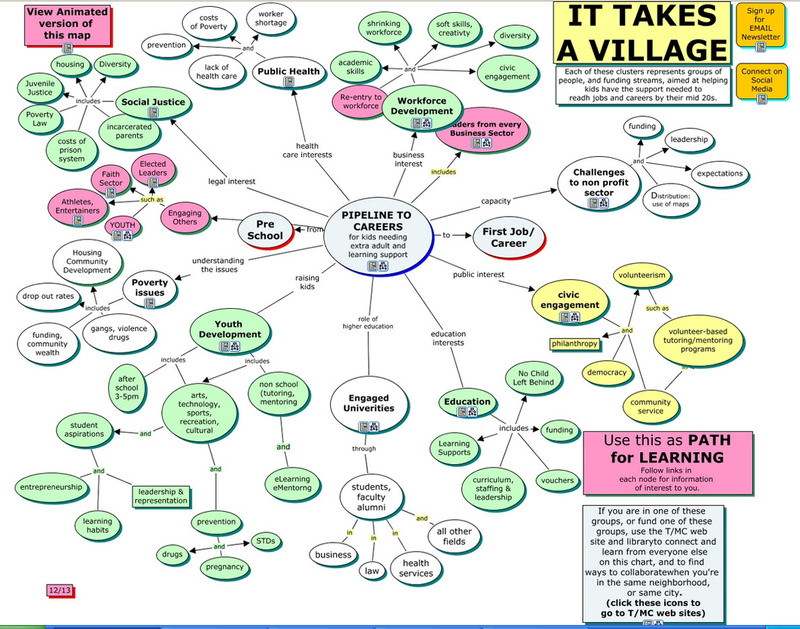 I've encouraged others to do the same, and created this concept map as a way to connect those people and their articles with each other. I added a link to Steve's blog today. In some ways, the people I point to are "companions" who I've been able to attract and connect in my own on-going efforts to have a positive impact on the world I live in. I invite other readers to join us. 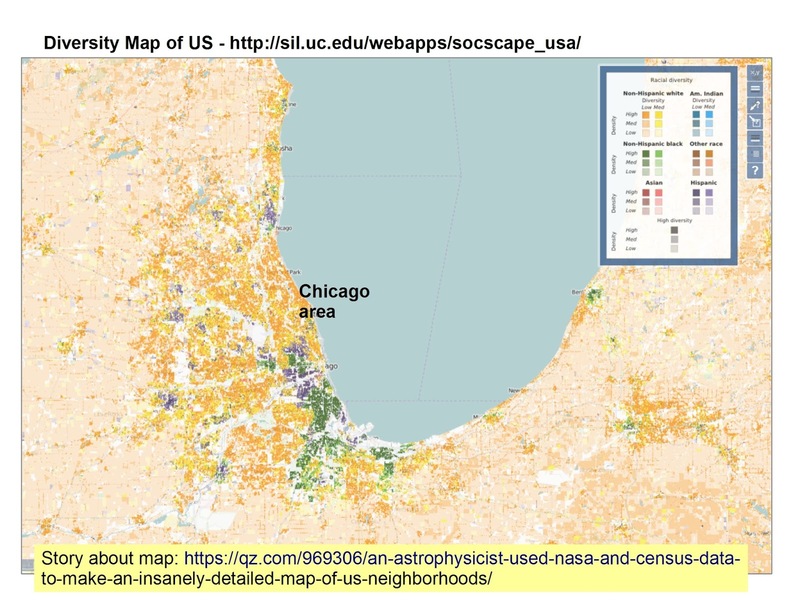 This is screenshot showing Chicago area, which I created using the interactive diversity map found at this site. This article describes how the map was created. Use for your own analysis of diversity and segregation in different parts of the US. Create your own story maps. Today on Twitter one of my new followers was Steve Whitla, who's based in Oxford, England. Before I follow back I always look at the types of Tweets someone is posting. 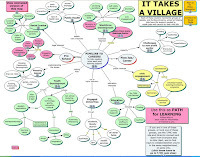 At the top of Steve's page was a TED talk video, talking about the value of maps and systems thinking. I've pasted it below and hope you'll look at it. 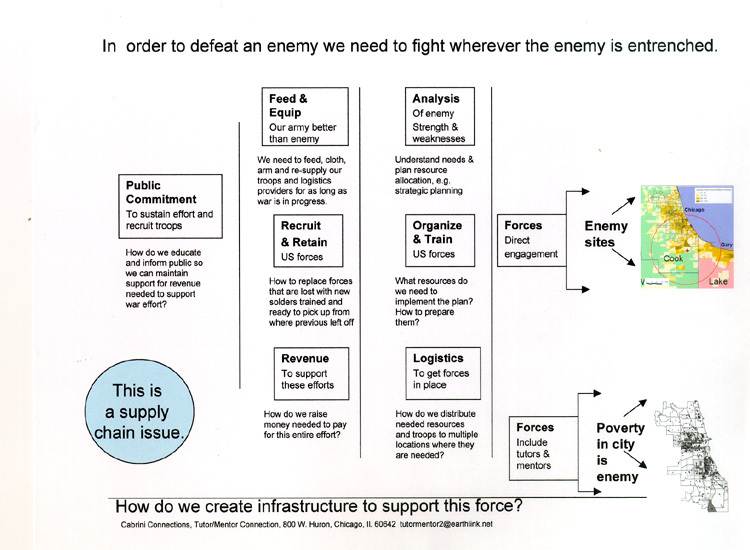 Below is one graphic that I've created that I thought of as I watched this talk. You can see an explanation of this graphic in this article. As I listened to the TED talk, I saw three distinct challenges. First is the work of collecting information and creating maps. On the right side of my graphic is a map of Chicago, with overlays showing where poverty is concentrated. I have been building additional overlays showing where non-school tutor/mentor programs are located, with a goal of helping all of them get the resources needed to help kids through school. You can find many stories on this and the Tutor/Mentor blog that include maps that focus on this goal. There's a significant cost involved in collecting the data for my maps, and keeping it current, and in making maps, or hosting maps on platforms like the Tutor/Mentor Program Locator. As you watch the TED talk, keep in mind the work and cost involved in creating the mapping platforms that are described. I've never found much money, or consistent talent, to support my own efforts. That's a major barrier to this work. Second is the work of motivating growing numbers of people to look at the maps, and use them in the type of reflection and analysis that is described in the TED talk. On the far left of my graphic is a node that focuses on "building public will". 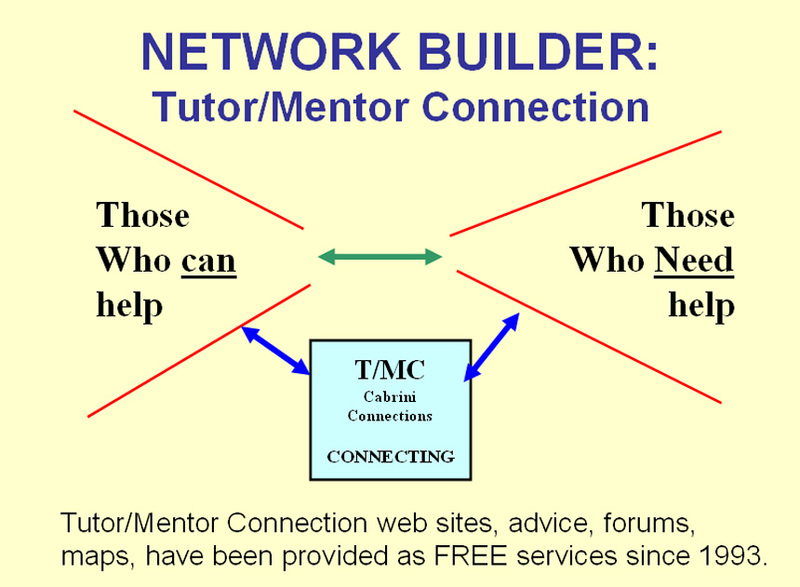 Step two in the 4-part strategy of the Tutor/Mentor Connection, which was developed in 1993, focused on building public awareness. Finding ways to do this without advertising and public relations dollars is a huge challenge. While the Internet offered a low-cost way to share ideas with the world back in 1998, it's now dominated by people with dollars to buy attention, or by people who have high visibility, and do crazy things, to attract attention. 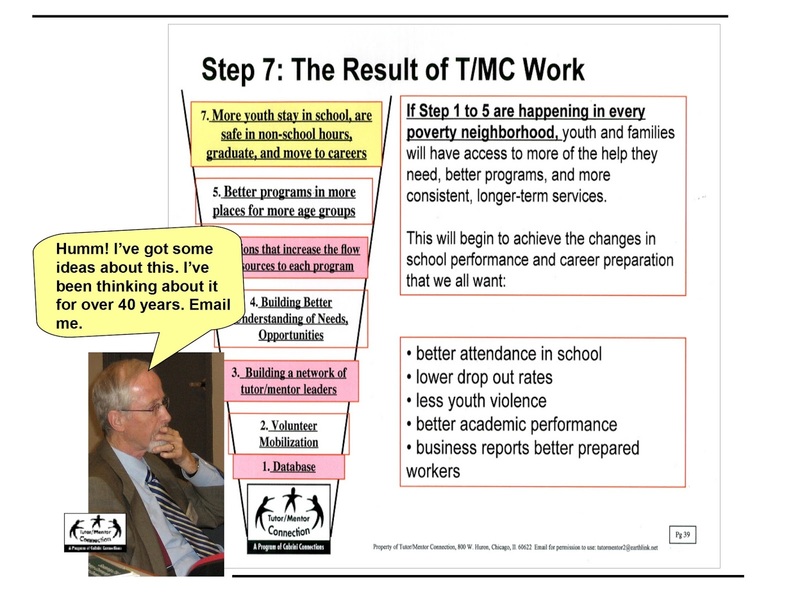 Yet, if we don't get enough people interested in looking at this information, and using time, talent and dollars, to support the work of individual tutor/mentor programs, as well as those who collect the information and create the maps, we won't have much success in making good programs available to more kids. Third is the role of network-builder, facilitator, mentor and teacher. That's the role Steve was taking in his TED talk, and the role I take with my web sites, blog articles, Tweets, and other social media activities. 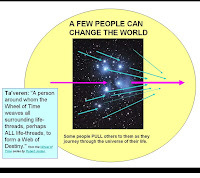 Someone, or many someones, needs to be making an effort daily to connect people with the maps and information available and help them understand how to use it, and how to apply it to their own life experience and opportunities. I often compare my maps to "blueprints" that are used by contractors to build buildings. At every stage of the building process, work needs to be done by people with different skills. They all need to be paid, or they normally won't do the work and the building does not get built. They also all need to have a certain level of skills, or the building won't stand, even if it does get built. In solving social and environmental problems facing the world we need blueprints, as Steve is suggesting in his TED talk, and we need resources to support all three stages of this process. I've been sharing ideas and graphics like this in articles at http://tutormentor.blogspot.com since 2005 and at http://www.tutormentorexchange.net since 1998. I look forward to connecting with others who are interested in these ideas. UPDATE: Here's an article about how traffic accidents are killing 1.25m people per year, and costing 3% of global GDP. The same systems thinking approaches that would apply to helping kids have greater support systems applies to this issue. Today's Chicago Tribune devoted two full pages to the changes taking place in the South Shore neighborhood of Chicago, and of how the violence is causing many young African American families to move out of the city, and often out of Illinois. I've been using maps to focus attention and draw resources to high poverty neighborhoods since launching the Tutor/Mentor Connection in Chicago in 1994. 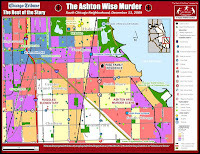 This map was created in 2009, following a shooting in the South Shore area and was included in this article, I hope you'll read it. I hope local leaders will also read it, and other articles I've shared in this and the Tutor/Mentor blog. 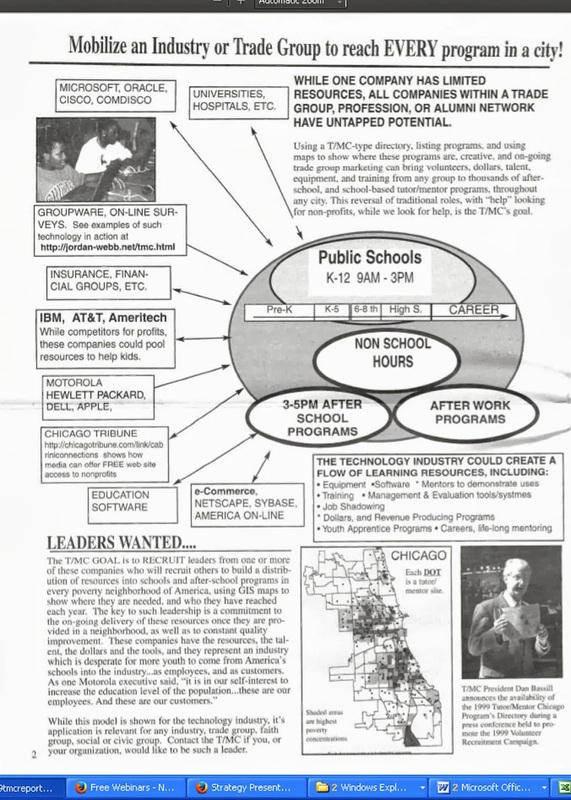 At the right is a page from a 1990s edition of the Tutor/Mentor Connection printed newsletter. (see it and others here). I've been sharing ideas like this for more than 20 years, yet with too little support from business, political leaders, faith leaders and peers. 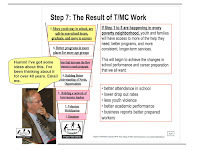 The appeal for financial support of the T/MC that was included in our 2009 article was not answered and since 2011 I've not had anyone on staff to create maps like this, or to update the interactive tutor/mentor program locator, which can also be used to create story maps. 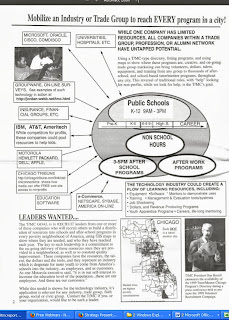 As the Chicago media remind us daily, the problems that prompted me to create the Tutor/Mentor Connection in 1993 (and launching in January 1994) are still with us in 2017. I'm just a lot older, and a lot poorer, and am now leading this effort via the Tutor/Mentor Institute, LLC, which is also not generating nearly the revenue needed to support this work in all the ways I describe in my past articles. Thus, a month ago I posted an article about a "do-over", inviting others to adopt and share ownership of the T/MC, using their own talents to lead it for the next 20 years...hopefully with greater impact and success than I've been able to provide. I hope you'll take a look and share this with others who might respond to the invitation.